Recently, I have entered the world of the self published with Stop Sexual Harassment Today!, which is available through Amazon. 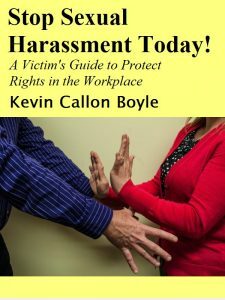 With sexual harassment in the news almost every day with a new public figure being accused by multiple women regarding the abuse they have suffered, there is clearly a need for women, and men, to understand their rights in the workplace. Whether its Harvey Weinstein, Matt Lauer, Charlie Rose, Bill Cosby, Louis C.K., Roy Moore, Al Franken, Dustin Hoffman, John Conyers and the list goes on, employees are fed up. This book is for those victims who need to take steps to stop their own battle with sexual harassment and take steps today and make a difference. This book goes through various reasons why employees fail to complain, helps you work through those obstacles, and learn how to make the record and properly document and make complaints that will help prove your case. The book covers how to get an attorney, what attorneys are looking for, the ins and outs of the contingency agreement with your attorney, and what to expect if there is a lawsuit. You will have a plan of action and no longer fear the unknown. You deserve peace of mind and you have a right to work in an environment that is free of unlawful discrimination and harassment. This book is a compilation of the many years, I have spent talking to employees and helping them with their problems. This has give me great insight into the reasons why employees often fail to complain of sexual harassment. It is counter intuitive, since the harassment is often so pervasive in the workplace and happens in many instances on a daily basis. With many of the public figures above the harassment happened years ago and the “me too” affect is astonishing. As stated in my book, there is no statute of limitation on doing the right thing. So, many of those who are complaining just want it to stop. Download my book from Amazon, it is a must read for employees and employers alike.